Prasso Ministries sent me a copy of the teen version of their Bible study. I had never heard of Prasso before, and learned that it has been around since the early 1990s and is designed to teach directly from the Bible about the character of God as well as helping to apply God's word into everyday situations. You can read about the founding of Prasso Ministries at their website. 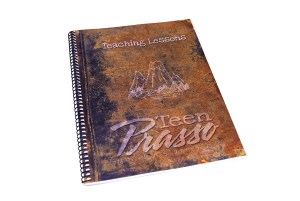 Teen Prasso Teacher's Manual ($35) - This contains a 13-week outline which shows how to use the program. It also includes some suggestions on leading a small group, especially helpful if you've never done that before. Each meeting opens with a teaching lesson. There are 6-10 pages of information for each lesson, which tells the faith story of two brothers. The story, told in two or three segments, is broken up by Bible teaching which helps to draw out the biblical truth in the story. After the story is told, a leader initiated discussion based on a set of questions students have had the opportunity to answer at home. The program is ideally suited for use in a small group. You can implement the teaching, group work in two ways: read the entire lesson, which makes for a complete script. The second option is to read the story segments, then use the provided outline to share the biblical teaching in a more extemporaneous fashion. 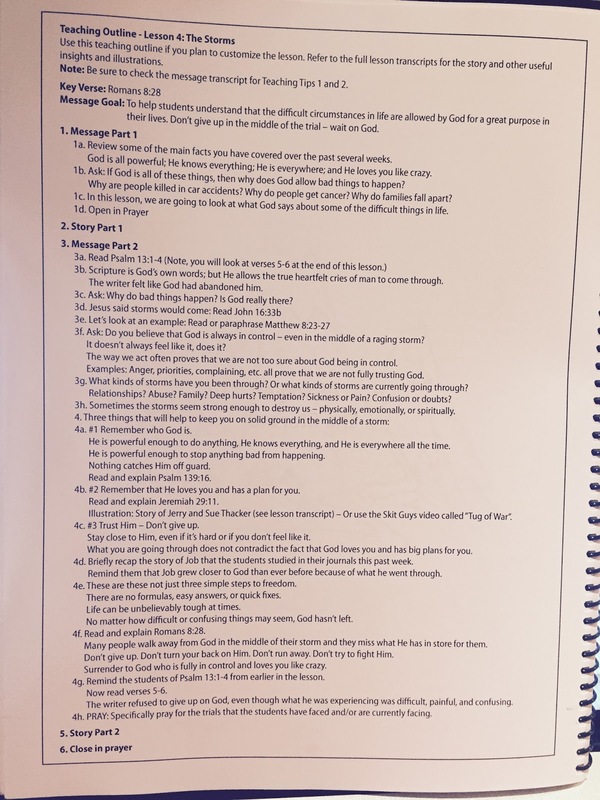 Photo from Teacher's Guide showing one of the two ways the lessons can be taught. This outline allows for more extemporaneous teaching of biblical truths woven through the narrative story. 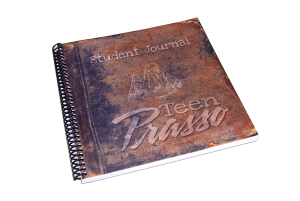 Teen Prasso Student Journal ($15) - This book is integral to the program. It provides 6 days of homework per lesson. Each day should take the student 20 minutes to complete the work. Additionally, there are a set of questions that are used for group discussion. 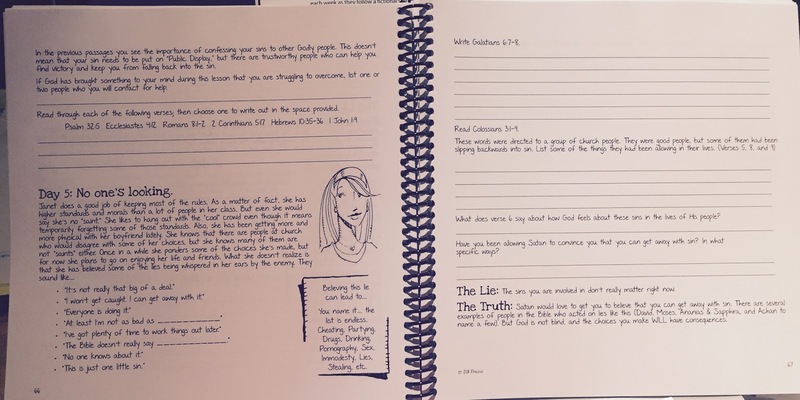 Students are asked to apply bible truths to their lives, and think through verses. 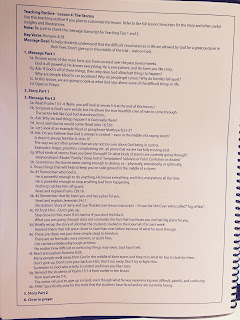 As the study progresses, students are asked to consider their own actions and habits in their lives and list out a osrt of action plan to make changes (prayerfully) in their lives to become more like Christ. By the way, prasso is Greek for "practice" -- which is exactly what this study is designed to do: helps students practice new ways of thinking and acting as they walk with Jesus through their teen years. A photo from the teen homework book. Both of these books are coil bound with soft cover fronts and backs. They are designed with an easy-to-read font and some pen and ink drawings inside, some of which help students visualize the message (and others are just there for visual interest). Why Doesn't 1+2 Add Up In My Life? My plan was to read through the story and lesson myself, then work through the workbook sections on my own -- to get a feel for how it flowed together. The story that author Eddie Zdanio created (which is based on Prasso founder Laura Baker's adult study) is a compelling allegorical story of two brothers, Derek and Brandon, who undertake a week-long adventure hiking in the Rocky Mountains. Like a modern day Pilgrim's Progress, the boys end up enduring some hardships and facing consequences of their actions. They end up confronting some prejudices from their past. Now, I have to admit, I haven't finished reading the last couple chapters, but so far, I've found the story to be an interesting read. I'm pretty curious to know what hardships they encounter, and am curious to see how God will speak to them in their situations. 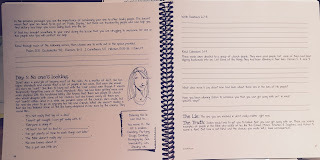 While I didn't use the workbook as a tool for writing down my ideas in order to participate in a discussion, I did like the general flow of the book -- going from some pretty basic concepts about God to spending some time thinking about our reactions to difficulties in life and recalibrating our reactions to them in light of our knowledge about God. For example, Chapter 3 goes into a detailed study of the story of Job, and helps students see that God was never far from Job. A verse a week is also provided for memory work, and students are asked to write it down -- as well as many other verses -- throughout the week. Final Thoughts and Opinions: You might be wondering how adaptable a Bible study like this is to one-on-one work, such as often happens in a homeschool. For our homeschool, I would definitely want Ben and I to spend time in discussion about the material (though I can see that perhaps honest conversation might be more likely if the discussion leader were not me), but I cannot imagine reading the entire lesson to him prior to working through the discussion questions. I'm much more likely to hand him the teacher's guide (after I've read it) and allow him to read the scripted story and lesson (as much as I like to still read aloud, this is just something he doesn't enjoy anymore). As I've pursued and answered the student guide questions myself, I've been tickled to see many references to pop culture that are from my "good old days" (Such as Karate Kid movie summary) and other tidbits of information about famous figures, in addition to traditional study of people from Biblical times. To me, this is a great way to engage teens -- meshing their faith with elements from the real world that they live in. I am excited about this study, though I think it will take a little tweaking if you are going to use it outside of a classroom or small group setting. However, I think the goal of the study -- to make biblical truths of Jesus real in the lives of teens to help them overcome the struggles common in their lives -- is worth the tweak.